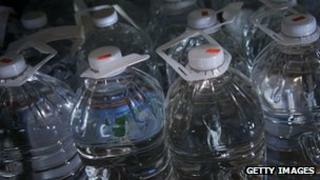 The US town of Concord in Massachusetts has banned the sale of bottled water in units smaller than one litre. The law came into effect on January 1, after a three-year campaign to reduce waste and encourage tap water use. First offenders will get a warning. Anyone caught selling the banned bottles a second time will be fined $25 (£15), with $50 for further offences. The Australian town of Bundanoon introduced a complete ban on bottled water in 2009. Concord has not introduced any restrictions on the sale of small bottles of other drinks, and the bylaw has an exemption in case of emergencies. Campaigners say Americans consume 50 billion small bottles of water each year. The bottled water industry says the small bottles are essential to modern life and encourage people to live healthier lifestyles. But Jean Hill who led the campaign for the ban in Concord, told the New York Times: "What I'm trying to do with this bylaw is to increase the barriers to buying single-serve bottled water." "In order to help people change, you need to put policies in place that steer them away from buying bottled water and toward considering the many other good alternatives." Some of the town's residents argue the ban is pointless, as they can go down the road and buy small bottles from shops in neighbouring towns. Ms Hill says she was inspired to begin her campaign by her grandson, who told her about a vast floating island of plastic waste in the Pacific Ocean.